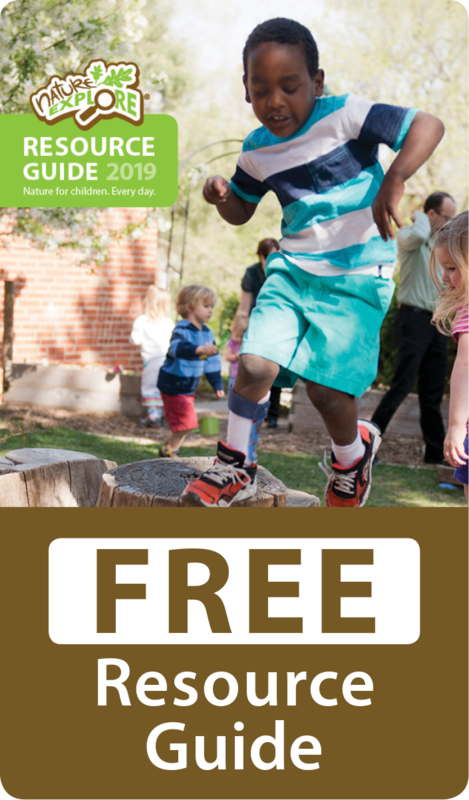 The House of Montessori is the winner of Omaha Magazine’s Best of Omaha Preschool from previous years including the present (2018). 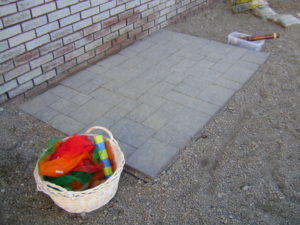 Ms. Janet shared her experience of outdoor classrooms with Dr. LaVonne Plambeck and soon a vision of replacing the plastic and metal commercial play structure, surrounded with artificial asphalt into an all-natural Nature Explore classroom became the goal. This embodied the healthy learning environment, which is based on Maria Montessori’s same concepts of a prepared nature-rich environment. 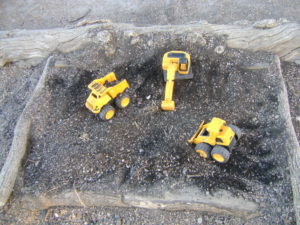 In one weekend a construction crew tore everything down to the bare ground. The only thing left was wonderful dirt. Then the hard work began, and with the community, parents, staff members and extended families support, the area was covered with beautiful natural river-rock, which has truly transformed it into a natural classroom. 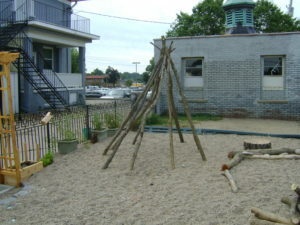 Many natural and native materials were used in the construction of the classroom, including tree cookies, birdhouses, personalized stepping stones, wooden pergola, wooden entrance arch, art tables, discovery tables and raised garden beds. The students helped plant flowering bushes along the fence which helped improve the visual-spatial skills in students. Considering the limited space, the House of Montessori was immediately faced with several challenges. To overcome these challenges the teachers began critically observing how the students were interacting with the space in order to assess areas of improvement. Communication on what was working and in what direction the project needed to go next was vital. 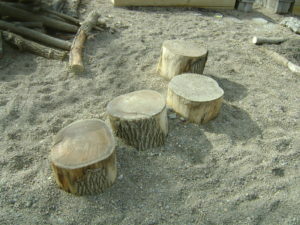 This is when the House of Montessori collaborated with Nature Explore design consultants to help develop a unique concept plan for the Nature Explore Classroom. This was very successful because the landscape architect/educator team was able to share some unique ideas for the individual learning areas using the field-tested Nature Explore program’s guiding principles for implementation of the different outdoor learning areas. Every year The House of Montessori’s community, families and staff work together during our garden work party and new projects are completed to enhance our lovely Nature Explore Classroom. 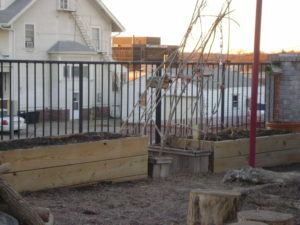 The House of Montessori received the Growing Together Garden Project Grant from the extension office in 2016 which helped us get the garden started. The House of Montessori has also received educational support from the extension office as well as access to a Master Gardener that visits our school during the garden-growing season. The House of Montessori was very fortunate to receive the Hy-Vee Garden Grant in 2017 that extended the developing garden. 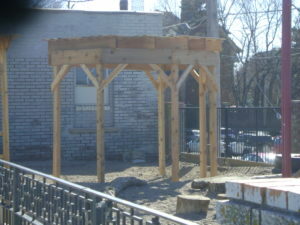 Two new raised garden beds, with an attached arch, and a Tipi were constructed by the students and parents. The House of Montessori also had the opportunity to hatch ducklings, chicks, and butterflies in the classrooms. After this experience, the students were more observant of the Monarch Butterflies on the Carnival Zinnias. These blooms were started from seedlings in the toddler room and then transplanted in the new raised garden beds. This played an important role in giving the students a hands-on opportunity to learn the different life cycles of insects. In the flower Gardens, student’s can hear the sounds of birds and bees, smell and see the colorful butterflies drinking the nectar of the vibrant flowers. Our Master Gardener was able to visually show the student’s how to observe the different life stages of the ladybug on the watermelon leaves in the garden. The students were filled with excitement when they were digging in the soil and finding insects. The students were especially intrigued when they observed the earthworms wiggling around in their hands. The House of Montessori teachers are all inspired by these new experiences and will continue to expand the Nature Explore successes beyond the classroom by sharing with the children an Adventure Backpack that contains the Nature Explore Families’ Club Kit and the STEM Learning Resources Primary Science Outdoor Discovery Set. The House of Montessori will continue the journey together, add new elements and change the environment as the students develop new skills, grow and learn in the outdoor classroom. 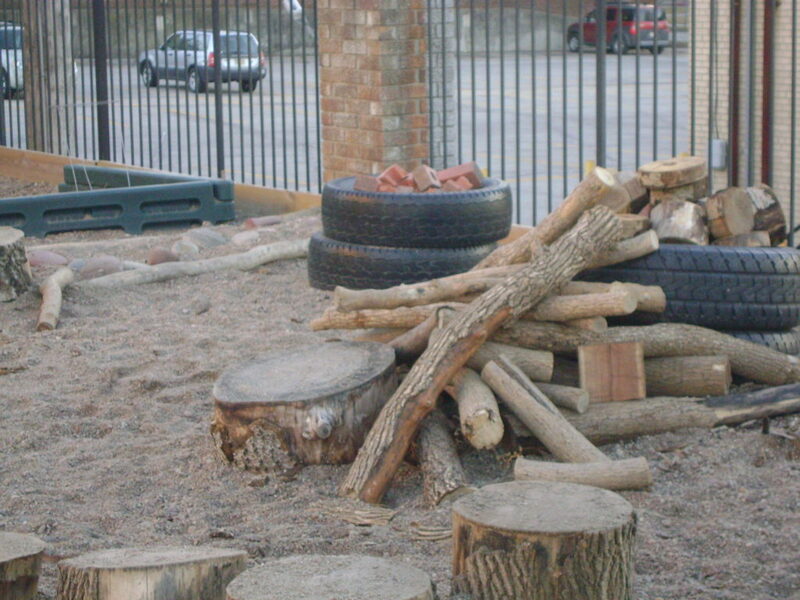 All areas of the outdoor classroom provide multi-sensory experiences with nature, opportunities for children to use their imagination, and develop their sense of curiosity by discovering everything nature has to offer in the natural world.